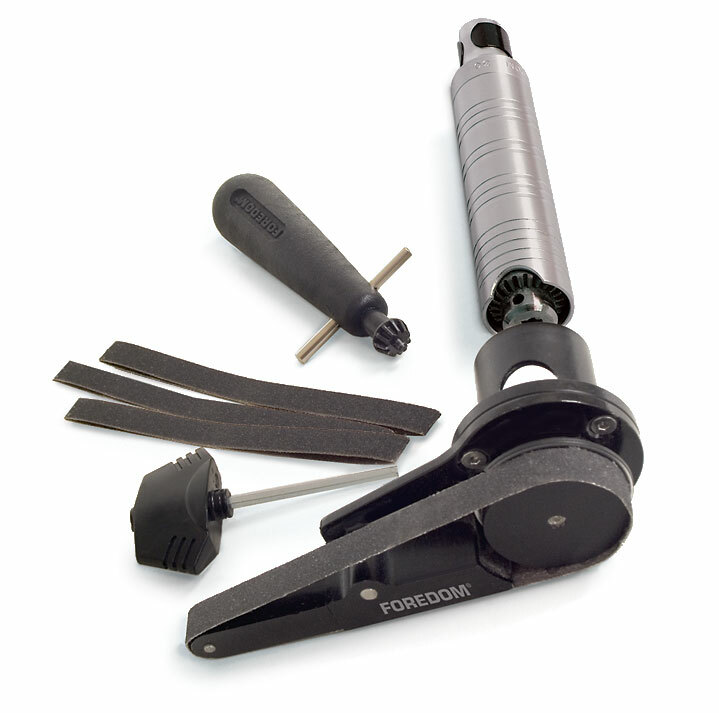 The AK797230 includes Foredom's Belt Sander Attachment, the H.30 Handpiece with HPCK-0 Chuck Key, and 10 Belts. A 180 grit belt comes installed and there are 3 each of 100, 180, and 240 grit belts. The Belt Sander offers a power assist to sanding jobs and can be used to sand and smooth metal, wood, acrylic and composite materials. It is an all metal, quality-machined aluminum device that attaches with ease over the top of the supplied H.30® handpiece (also fits H.30SJ slip joint and H.30H square drive models). It has 3 permanently lubricated ball bearings. Sandpaper belts measuring 7mm (9/32") x 257mm (10-1⁄8") come with the attachment and are available separately in 5-packs and assortments. Specifications: 4-7⁄8" long x 1-3/4" wide (at widest) x 2" tall. Ship weight: 1-1/2 lbs. Click the button below to add the AK797230 Kit with Belt Sander and H.30 Handpiece to your wish list.